A team of physicists at the U.S. Department of Energy’s Brookhaven National Laboratory has obtained the first glimpse of miniscule air bubbles that keep water from wetting a super non-stick surface. Detailed information about the size and shape of these bubbles — and the non-stick material the scientists created by “pock-marking” a smooth material with cavities measuring mere billionths of a meter — was published online on February 24th in the journal Nano Letters. “Our results explain how these nanocavities trap tiny bubbles which render the surface extremely water repellent,” said Brookhaven physicist and lead author Antonio Checco. The research could lead to a new class of non-stick materials for a range of applications, including improved-efficiency power plants, speedier boats, and surfaces that are resistant to contamination by germs. Non-stick surfaces are important to many areas of technology, from drag reduction to anti-icing agents. These surfaces are usually created by applying coatings, such as Teflon, to smooth surfaces. But recently — taking the lead from observations in nature, notably the lotus leaf and some varieties of insects — scientists have realized that a bit of texture can help. By incorporating topographical features on surfaces, they’ve created extremely water repellant materials. 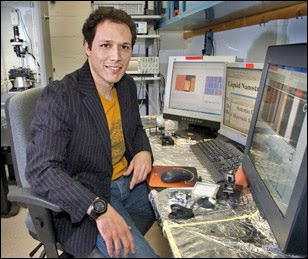 “We call this effect ‘superhydrophobicity,’” said Brookhaven physicist Benjamin Ocko. “It occurs when air bubbles remain trapped in the textured surfaces, thereby drastically reducing the area of liquid in contact with the solid.” This forces the water to ball up into pearl shaped drops, which are weakly connected to the surface and can readily roll off, even with the slightest incline. “To get the first glimpse of nanobubbles on a superhydrophobic surface we created a regular array of more than a trillion nano-cavities on an otherwise flat surface, and then coated it with a wax-like surfactant,” said Charles Black, a physicist at Brookhaven’s Center for Functional Nanometerials. This coated, nanoscale textured surface was much more water repellant than the flat surface alone, suggesting the existence of nanobubbles. However, because the nanoscale is not accessible using ordinary microscopes, little is known about these nanobubbles. Image 1: The central image is the optical profile of a water drop placed on "nanopitted" silicon; the right image is a scanning electron micrograph of the nanocavities; and the left image is a cartoon illustrating the nanobubbles' shape as inferred from x-ray measurements. To unambiguously prove that these ultra-small bubbles were present, the Brookhaven team carried out x-ray measurements at the National Synchrotron Light Source. “By watching how the x-rays diffracted, or bounced off the surface, we are able to image extremely small features and show that the cavities were mostly filled with air,” said Brookhaven physicist Elaine DiMasi. According to the scientists’ observations, the bubbles are only about 10 nanometers in size — about ten thousand times smaller than the width of a single human hair. And the team’s results conclusively show that these tiny bubbles have nearly flat tops. This is in contrast to larger, micrometer-sized bubbles, which have a more rounded top. Therefore, in contrast to materials with larger, micrometer-sized textures, the surfaces fabricated by the Brookhaven team may exhibit more stable superhydrophobic properties. “These findings provide a better understanding of the nanoscale aspects of superhydropobicity, which should help to improve the design of future superhydrophobic non-stick surfaces,” Checco said. Nano Letters, published online on Feb 24, 2010. DOI: 10.1021/nl9042246. Abstract.